Continuing a peculiar trend of concert-going on Sunday nights, I swung by The Boat this weekend to check out Edmonton’s Tim Gilbertson, whose self-titled debut I wrote up a few weeks ago. Though demonstrating some impressive songwriting chops – particularly considering how young he is – I wasn’t necessarily expecting a life-changing live set and that’s pretty much how things played out. On the plus side, the live setting gave the material a welcome dose of organic-ness and spontaneity. While the record is far from overproduced, it does sound very precise, very studio-y. The slop of a live band was a welcome new dimension to the material. On the negative side, the relative green-ness of the band was pretty evident. While granted, an audience that could generously be described as light doesn’t necessarily bring out one’s inner showman, there was a sort of nonchalance to their stage presence that didn’t really do the material justice. Also along those same lines, I really question the inclusion of two covers in the set – not because I’m against covers, obviously I love ’em – but the last thing the world needs are more Neil Young and Beatles covers, especially when the album you’re ostensibly promoting has a wealth of great material that should be showcased. Leave the bar band material to the bar bands. In case it’s unclear, all criticisms are meant to be constructive – I really believe Gilbertson has got some serious talent, an opinion reinforced every time I listen to the record and further appreciate how strong the material is. I hope that next time they swing through town, the live performance has evolved to the point that it can do the songs proper justice. Tim Bracy talks to Harp about the sad end of the Mendoza Line and there’s a much more in-depth feature on the last days of the band in the new Magnet. LiveDaily and The Arizona Daily Wildcat, The Crimson White and The Temple News talk to Josh Ritter. It’s Sadies saturation this weekend – in addition to the Friday night at Lee’s/Saturday night at the ‘Shoe double-header, they’re now doing an in-store at Rotate This on Friday night at 6PM to go along with their Saturday afternoon in-store at Sonic Boom (which is now at 4:30PM, not 1PM as originally scheduled). Austin360 deduces the secret to Okkervil River’s success and as a sidebar, offer 14 facts you might not have known about Will Sheff. Nicole Atkins gives Spinner a video guided tour of Asbury Park and shows AOL Music around Charlotte, North Carolina and New York City. Did you see her on Letterman last night? Stunning. If/when I find a clip of it online, I shall post it. She’s at Lee’s Palace on November 18. Update: Head to Indieblogheaven to watch. Thanks! The Guardian documents the downside of being the Arcade Fire while drummer Jeremy Gara talks to This Is Nottingham. The Northwest Herald talks to The Hold Steady’s Tad Kubler. Drive-By Trucker Patterson Hood tries to describe Brighter Than Creation’s Dark, out January 22, to Express. The Irish Times profiles The National. Drowned In Sound invites Jarvis Cocker to read a Hallowe’en story (it’s a 14-minute MP3). Stylus calls it a day, offering farewells, reminiscences and the first best-of ’07 list of any consequence. Thanks guys, you’ll be missed. Much of this past weekend was spent catching up on television. In brief: season two of Dexter makes me happy I stuck with the show through a shaky first half of season one, Heroes makes me sad that Kristin Bell is being wasted like this, How I Met Your Mother makes me amazed what kind of stuff is allowed to be aired at 8PM and The Office, thankfully back to half-hour installments, makes me agree that there really can be too much of a good thing. But most exciting is that I finally got to sit down and watch the first four episodes of Pushing Daisies and, though it will come as no surprise to anyone who knows my tastes in television, I would like to declare for the record that I love this show. In a nutshell, it’s a fantastical hour-long comedy about a pie maker with the ability to bring the dead back to life with a touch, and then kill them forever with another touch. Their new lease on life lasts exactly 60 seconds or else someone/thing else in near proximity dies instead. The pie maker uses this ability to work with a private investigator to solve murders and collect the rewards until one day, he ends up bringing his childhood sweetheart, newly murdered, back to life and opts to keep her alive (at someone else’s expense) though they can never touch. Hilarity ensues. Yes, it’s a big nutshell but that’s how it goes. Not surprisingly, the mastermind behind this show – Bryan Fuller – is also the one who brought us the equally wonderful Wonderfalls (the actor who plays pie maker Ned was also the layabout brother on Wonderfalls) but happily and more than a bit surprisingly, Pushing Daisies is already a hit for the new season and has been picked up for the full season. Surprising because usually shows this idiosyncratic, stylish and all-out quirky are doomed from the get-go. The whimsical, cartoonishly technicolour visuals are almost certainly the most unique on television – network or otherwise – but belie the charmingly dark sense of humour at work. Re-read the plot – how can it not be dark? The cast handles the sharp, rapid-fire and deliciously odd dialogue perfectly and Anna Friel, as lonely tourist Charlotte Charles, is a blend of Zooey Deschanel and Mary Louise Parker that could have come right out of a focus group consisting of me and me only. Some reviews I’ve read have wondered about the shelf life of the show’s recipe, speculating that what was charming at first will drift into irritating as the season wears on. This is entirely possible. That the show has seemingly engaged a large portion of the great unwashed that make up the network TV audience, not a demographic I generally have a lot of faith in, is astonishing in itself – usually critical acclaim like its gotten is a death sentence. But for now, I will sit back and enjoy the fact that there’s still 18 more episodes to come, and heartily recommend you do the same. Tuesdays at 8 on CTV and Wednesdays at 8 on ABC. The New Yorker profiles David Simon, the creator of my other favourite current show (pretty much the complete diametric opposite of Pushing Daisies though dead people do figure heavily into both), The Wire. The final season starts January 6. The Sydney Morning Herald and Harp talk to Steve Earle. Bummer to hear BrooklynVegan report that Land Of Talk got a pile of their gear ripped off last week in New Jersey. Hope they got enough replacement equipment together for last night’s show at the El Mocambo. But good things happen in New Jersey, too (though less so if you have allergies – not for nothing is it called The Garden State). Consider native daughter Nicole Atkins, whose Neptune City is finally out today and which you can stream below at Spinner. The Star-Ledger and ACED have feature interviews with her about her record and home state. She will be at Lee’s Palace on November 18 opening for The Pipettes and is on Letterman tonight! With Jennifer Connolly! And SLASH! Maybe he’ll sit in with the band? And speaking of Pipettes, MySpace has a “behind the scenes” video interview with the band while The Washington Herald and Drowned In Sound offer old-fashioned text ones. Also streamable and out today is the whole of the I’m Not There. More tracks beyond the four initially on the MySpace have gotten out there in the past week but the full album stream is certainly your best one-stop shop for previewing the riches contained within. And congratulations to Janet and Craig who won copies of the album via my contest. Pitchfork reports that the first proper Magnetic Fields album since 2004’s i will be out on January 15 of next year and bear the almost certainly misleading title of Distortion. But if you want to believe that Stephin Merritt has discovered the joys of the Big Muff Pi, you go right ahead. Also forthcoming – Another Country, the new record from Tift Merritt, due out February 26. NPR is streaming a World Cafe interview and session from Metric which includes some new songs for those seeking a sneak preview of their next album. Also streamable at NPR, The New Pornographers’ recent show in DC complete with opening sets. Billboard talks to Adam Franklin about the Swervedriver reunion, currently targeting an April 2008 return to action. Drowned In Sound challenges Mogwai’s Stuart Braithwaite to say something nice about Radiohead. Which he does. With many caveats. It’s infrequently that I go to a show where I know hardly anything about the bands who’re playing, but this weekend, for Hallowe’en, I went as someone just like that and hit up The Thermals’ show at the Horseshoe. What I did know going in was that this was the first-ever Toronto appearance for the Portland trio and that they were still working last year’s highly-regarded The Body, The Blood, The Machine. And what I knew coming out was that they put on a pretty terrific show. A no frills show to be sure, but a loud and sweaty one that packed a lot into an hour, including reminding what a shame it is that the descriptor “pop-punk” has come to imply suburban skate punks with lip rings rather than the wordy, hook-filled, anthemic intensity that Hutch Harris and his bandmates delivered. Think John Darnielle fronting The Pharmacists. I couldn’t really make out any of the words but rest assured the next time they’re back – and judging from the enthusiasm of the audience they’ve got good cause to return – I’ll have played catch-up and will be singing along. Support was locals Marvelous Darlings who were even more of a blank slate to me than the headliners and also impressed. 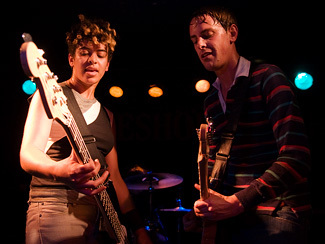 They could have taught the Thermals a thing or two about set economy, packing their blend of ’50s-vintage rock’n’roll and ’70s-grade punk attitude into an impressive and ultra-compact 20 minutes. Always leave them wanting more, right? They could have played a whole half hour and I’d not have complained. Chart talked to The Thermals about the concept behind The Body, The Blood, The Machine. Concept? Harp delves into the secrets of Okkervil River’s Stage Names and reveals how a third of the band thought they were “awful” and “the worst thing” they ever heard but joined anyways. Which is actually consistent with me, who thought they were terrible the first time I heard them and now I love them like kittens. The Star-Telegram asks five questions of Spoon’s Britt Daniel while NPR has both an interview and their recent show in DC available to stream. Express meet the freewheelin’ Yo La Tengo, as does the The Grand Rapids Press. Mark Eitzel talks to Billboard about the looser, more upbeat American Music Club that recorded The Golden Age, due out on Feburary 19 of next year. Incendiary gets literary with Ramesh from Voxtrot. New Zealanders Goldenhorse, whom I wrote about here and whom many of you seemed to take to as much as I did, have a new album, Reporter out today. The press release for the album features singer Kirsten Morrell talking about the record which I suspect I’m going have a devil of a time tracking down. Sonic Boom (Bloor/Bathurst) will be hosting an in-store from The Sadies this Saturday, November 3, at 1PM 4:30PM – for those who who can’t make either their Friday night show at Lee’s Palace or their Saturday night show at the Horseshoe or who can and are making both but just need a little more Sadies in their lives. 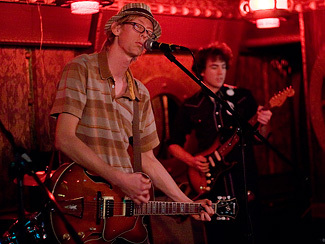 Jonathan Bree of The Brunettes talks to Aversion. New videos! Finally, a proper clip from St Vincent – just as strange and wonderful as you’d hope – and a new one from Great Lake Swimmers’ Ongiara. The Scotsman gets to know Asobi Seksu frontwoman Yuki Chikudate. Filter has details on Dirty On Purpose’s forthcoming Like Bees EP, due out on January 15. Some of the new songs are streaming on their MySpace. The last I heard from Iceland’s Mum was their 2002 release Finally We Are No One which, while beguiling in its unique tinkertoy electronica way, didn’t compel me to keep up with their subsequent releases, especially with the departures of both Valtysdottir twins who had been both the voices and faces of the band as I knew them. So it’s a bit of a surprise that their latest release, Go Go Smear The Poison Ivy, doesn’t sound like the completely different band that I’d expected it to. Which makes sense, I guess, since the sisters were only half of the band and the remaining members were the ones responsible for the musical end of things, now supported by an expanded cast of vocalists and merrymakers. And so their distinctive blend of glitchy synths and sing-song melodica and glockenspiel melodies persists, buoyed by strings and horns a richer, more organic sweep and an overall, sunshiney, teddy bear picnic giddiness. While it’s commendable that Mum has not only survived the loss of what had essentially been their identity and turned out a new statement of intent with Poison Ivy, it tries a bit too hard to distance itself from the the introverted under-the-covers intimacy of its previous incarnation and loses some of the mystery and magic that made No One special. Maybe on the next record, they could let the clouds gather a bit again and head indoors. Mum are at the Opera House this Friday night and courtesy of Fat Cat Records, I’ve got two pairs of passes to give away to the show. To enter, send me an email to contests AT chromewaves.net with “Mum’s the word” in the subject line and your full name in the body. Contest will close at midnight, October 30 (Tuesday night). Yes, it was a bit of a bummer when The Go! Team’s Hallowe’en party originally scheduled for October 31 at the Opera House got moved to an All Saints’ Day party on November 1 at the Phoenix, but it could be worse – it could be All Saints. And anyways, if you’ve heard Proof Of Youth or seen the Go! Team live, you’d know that no matter where or when they play it’s going to be a rollicking good time – not unlike being trapped in the audio editing suite for an crossover episode of Hawaii 5-0 and Starsky & Hutch with the Kool-Aid Man, who just happens to have been spiked by Captain Morgan. And yes, that’s my idea of a rollicking good time. So I’m pleased, courtesy of Against The Grain and Secret City Records, to be able to offer up this two-fisted Go! Team giveaway. On one hand, I’ve got two pairs of passes to the November 1 show at the Phoenix in Toronto, and in the other hand, I’ve got three copies of Proof Of Youth on vinyl, all to give away to five lucky peeps. To enter, leave me a comment below declaring “Trick!” if you want to go the show or “Treat!” if you want the vinyl. Either or, not both. Gotta spread the love around. Also tell me your best ever Hallowe’en costume (or if you don’t celebrate Hallowe’en, something equally amusing and tangentially related and be sure to include a contact-able email address (spam-proofed if you like). Obviously, the concert giveaway is limited to Toronto-area residents but anyone in Canada can go for the vinyl. Contest closes at midnight, October 29. Update: Just a reminder that the vinyl is only available to Canadians. I appreciate the enthusiasm from readers hailing from elsewhere – and feel free to share your stories if you like – but the prizing for this one is Canuck-only. Thanks. And head over to The Smudge Of Ashen Fluff for some MP3s of the band’s recent appearance on KCRW, wherein they turn and early AM appearance on Morning Becomes Eclectic into a dance party. What’d I tell you? Update: You can also watch video of their performance at KCRW. Yay.